← Are Electronic Cigarettes a Safe Alternative to Smoking? But preventing, detecting, and treating serious health conditions are not the only tasks that matter. It’s also worthwhile and satisfying to effectively address the minor annoyances that afflict people. Accordingly, I thought I’d share some pearls an esteemed dermatology colleague shared with me yesterday about brittle fingernails. 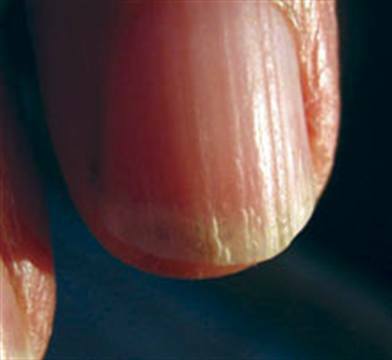 This occurs when superficial grooves in the nails lead them to split. To treat this problem he recommends an over the counter Biotin 3 mg pill daily, applying moisturizer to the nails regularly, and avoiding excessive water exposure to the nails. If this is not effective, there is also a new, expensive product called Nuvail that can be applied to fingernails to prevent friction on the nail surface and protect against the effects of moisture.